Bi bim bap is one of my favorite Korean dishes. You have a little bit of everything in one bowl: veggies, meat, rice, hot sauce. 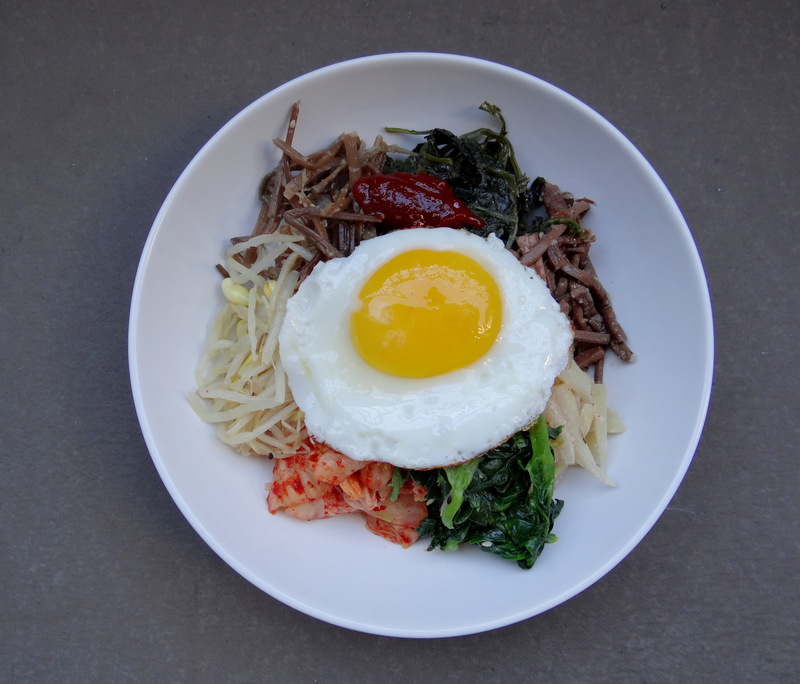 Every bi bim bap bowl is different- it depends what you want in it or what restaurant you go to. Usual ingredients include bean sprouts, spinach, mushrooms, carrots, and some sort of meat. If you are awesome, you could make all the ingredients from scratch but if you are lazy like me, just go to the Korean market and buy the ingredients in the side dish section.. there are some places that have everything packaged and ready to eat! I bought a package of veggies and just poured everything on a bed of rice. I didn’t include meat this time around and added kimchi. Add hot red pepper paste, sesame oil, sesame seeds if desired, and of course, you can’t forget an egg! Some people like a fried egg, some like a raw egg.. whatever you desire. Mix everything together and you’re good to go! Recipe: Arrange everything on a platter. Next, you need to prepare a large platter to put all your ingredients on. Rinse your bean sprouts 3 times and put them in a pot with a cup of water. Add 1 ts of salt and cook for 20 minutes. Drain water and mix it with 1 clove of minced garlic, sesame oil and a pinch of salt. Put it on the platter. In a heated pan, put some oil and 200 grams of ground beef and stir it. Add 4 cloves of minced garlic, 1 tbs of soy sauce, 1/2 tbs of sugar, a little grounded black pepper, and sesame oil. Put it on the platter. Put your rice In a big bowl, and attractively display all your vegetables and meat. Place the sunny side up egg on the center. Serve it with sesame oil and hot pepper paste. Lastly, mix it up and eat!